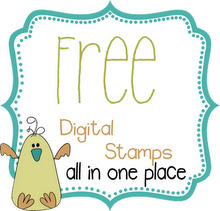 I missed the Less is More challenge last week as I am still having problems with my PC. I am using my laptop and I am missing my PC so much. Anyway I thought I would give this weeks challenge a go. I have used a plain red card that has a white back to it. The hearts were punched out with a Martha Stewart Lace Heart Punch and the sentiment is a stamp I found in my stash. I added a little pearl heart just to finish it off. I hope this is okay for the challenge. How lovely, the red card base is gorgeous, a perfect CAS design. Hola Maureen, beautiful card, i love your hearts punch wonderful!!!. The little heart reflects the border really well. 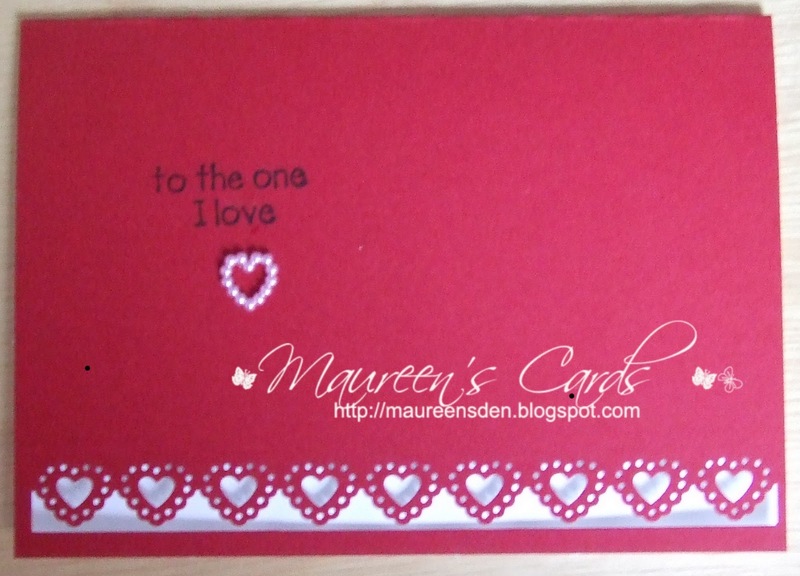 Beautiful card Maureen,love the border. The hearts border looks great and I like the matching pearl heart you made. 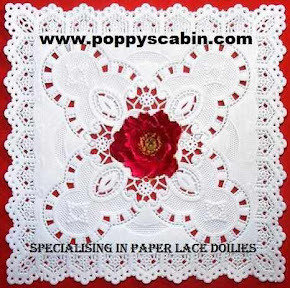 Hi Maureen, a great design with a pretty lacey border. Thats so sweet..love the little heart! Pretty card, love the little pearl heart. Glad you are back, thanks for tip - it works! Such a pretty card Maureen. 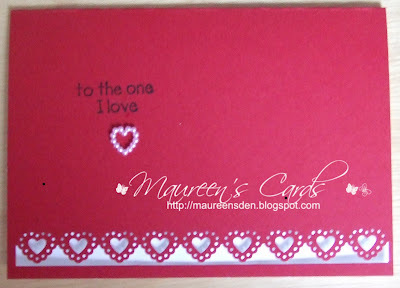 Love the pink card with the white underneath - it shows off the heart border beautifully. It's a great card-I love that border! What a lovely card, good idea.